I had high hopes for Mario Maker. High apple pie in the sky hopes... But what I’m getting instead are levels created by people confusing poor game design with difficulty. I’m all for a difficult Mario game, I really am. I personally find that all the Nintendo made ones are far to easy. I shouldn’t be able to finish your game, beat every level and collect every item, and still have amassed 99 lives because I don’t die. But those Mario games were made for everyone, so I guess I’m okay with their difficulty, must appeal to the masses right? 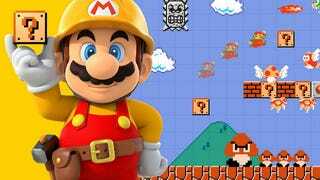 Now along comes Mario Maker, finally my Mario prayers have been answered! Or so I thought... Don’t get me wrong, I have played a whole mess of excellent made super challenging levels. But it seems to me, for every one excellent level I play, I need to wade through like five poorly made, awful levels made by people who I am pretty sure just want to see their completion percentage be as low as possible. Now I understand that my taste in levels differs from others, everybody finds different things entertaining right, but surely nobody thinks that nothing but a series of single block jumps all the way across the world is fun... right? Please say I’m right... Oh, you do think that’s fun? Okay... how about we take all those single block jumps, and put a super janky, never been good Mario 1 spring on it. Surely that maximizes the entertainment of your player! I don’t need to finish your level to applaud it, you don’t need to be the next PangaeaPanga (I have tried both of his uploaded levels and now question my existence as a Mario player). Don’t make me carry that spring you had hidden in a regular brick block at beginning of the level all the way to the end to spring board over a stack of winged up bloopers to get to the flag, cuz I’ll do it. Maybe I have a problem, but I refuse to give you the satisfaction of my incomplete percentage... Typing this I am realizing I may sound like a crazy person... but there is no turning back now!